The official website of the upcoming Charlotte anime has revealed the second promotional video of the anime. Additionally, the site has also revealed that Anant-Garde Eyes, the producers of the music of Angel Beats!, will return to produce the music for Charlotte. The anime’s website has revealed that music producers Anant-Garde Eyes will be producing the music of the anime, alongside music composer Jun Maeda. The group itself is well known for the production of the music of Angel Beats! and Mekakucity Actors. They have also arranged the theme songs for the Ending themes of both anime, as well as the OP of Clannad: After Story. 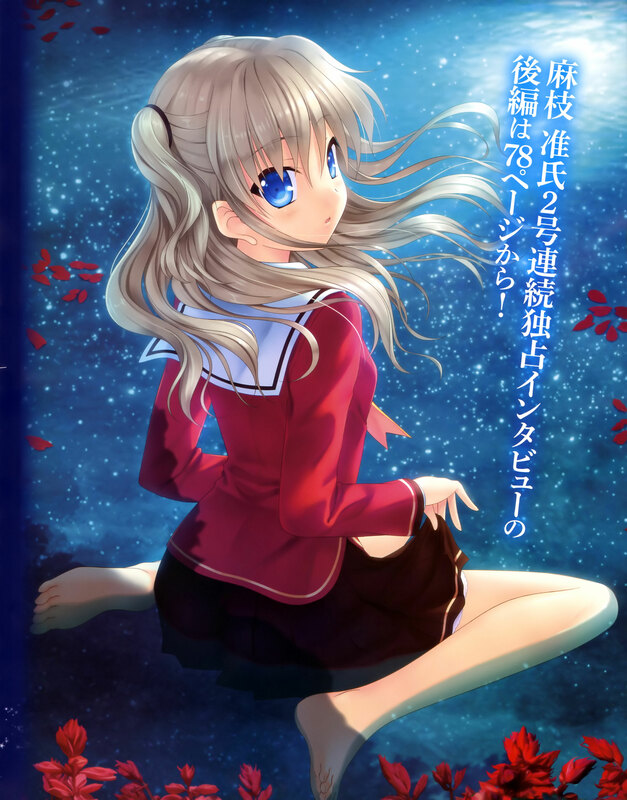 Nao Tomori, the hard working, narcissist first year student who is also the president of the student council. She has the ability to remove herself from the vision of one person at a time. She studies very hard and has issues with problematic students. She’s also huge fan of one of the anime’s bands, ZHIEND. Yuu Otosaka, a rude first year student with the ability to hijack the bodies of others for five seconds. Uses the ability to memorize test answers of better students. He is an idiot and is also bad at studying. He usually behaves as if he were smart, but he is actually a chronic cheater. Once he makes friends with somebody, they notice that he is an idiot. He is not sly or crafty at all. He just says things which sound clever, and he is a narcissist. Joujirou Takajou, he can move at such high speeds that he looks like he’s teleporting. However, he cannot totally able to control where he stops, so he has to wear protective gear under his school uniform to prevent injury. Yusa Nishimori, the lead vocalist for the band How-Low-Hello and a medium able to speak to the dead. She uncontrollably channels her deceased elder sister. When this occurs her appearance changes, such as her eye color from blue to red. The previous issue of Dengeki G’s magazine has revealed the first details of the anime in an interview with Jun Maeda. The Charlotte anime will be airing this July during the Summer 2015 anime season. More information will be revealed in the upcoming months in Dengeki G’s Magazine and on the anime’s website.